Spring is here in the northern hemisphere and those of us in northern climates are ready to get back to playing outside without wearing seven layers of clothing. This is the time of the school year when my students always ask about having class outside. 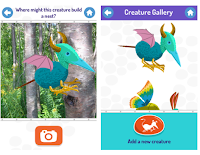 If you're an elementary school teacher who is ready to get your kids outside for a lesson, take a look at Plum's Creaturizer.